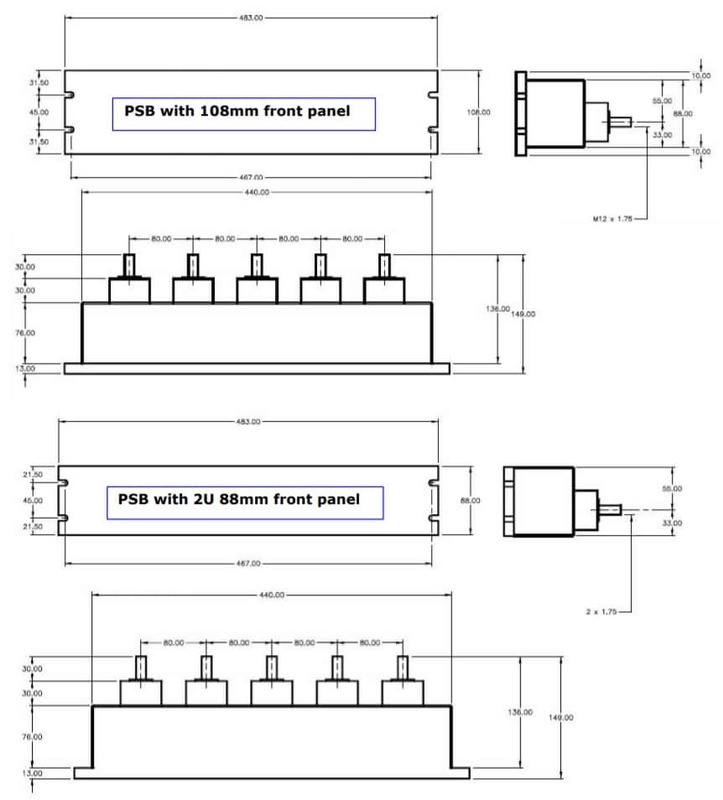 This page has all the information you need about configuring Powersafe Connectors in Phase 3's online store. We explain the industry jargon, power cable requirements and product information. Technical Questions? Ask Our Engineers! Can’t find what you need? Ask our engineers – they’ll reply within 24 hours! Email - Our engineers need this to reply. Question - What do you want to know? What are the types of Powersafe connector? There are two primary types of Powersafe Connector. A ‘Line Connector‘ or ‘Inline’ connector acts as the electrical plug for connection between an appliance and the power source. The line connector consists of an insulated casing with a single pole that fits into a Powersafe socket. The connectors are fitted with a spring loaded plastic cap that prevents accidental finger touching of the contact. Powersafe contacts are available to suit power cable from 25mm² to 300mm². A ‘Panel Mount Connector‘ or ‘Mounted Connector’ acts as the electrical socket for connection with a Powersafe Line Connector. The Panel Mount connector is mounted onto a distribution board or panel through 4 fixing holes on the flange. The Panel Mounts are terminated with M12 threaded post to a standard lug. Panel Connectors are supplied fully assembled with an M12 nut and spring washer for secure connection. Use the slider below to help you distinguish between the connector types. Both Line and Panel Mount connectors are available as Source and Drain. Source Connectors are usually the live end of the connection. Source connectors have a Male Contact and a Female Insulator. Drain Connectors are usually not live ends and receive the connection. Drain Connectors have a Female Contact and a Male Insulator. Use the slider below to help you distinguish between the genders. Termination: How are Powersafe Connectors terminated? There are 2 types of termination for Powersafe, Crimp and Set Screw. Crimp Terminations have a different sized crimp bucket on the copper contact to allow a range of cable sizes. Crimp terminations allow for an incoming cable range of 25mm² – 300mm². Phase 3’s standard size is 120mm² and 240 mm², which for instance fits with standard sized HO7RNF power cable. We recommend 3 hexagonal crimps are made with a certified crimp tool to terminate safely. Set Screw Terminations use standard set screws to secure the connector to power cable. This type of plug are considered a temporary termination as screws can be removed with an Allen Key to remove the connector and reuse the cable. Set Screw Connectors have a standard 120mm² size and for any cable smaller (95mm² – 25mm²) a reduction kit is used to fit the contact and cable. For more information on terminations and assembly, view our Powersafe Assembly Guide. Clamping Range: what are the Gland Sizes? After selecting your Termination, you will be asked to define your Clamping Range. Clamping Range determines the size of the gland we assemble onto the back of your connector – this is defined by the size of your cable. The gland grips your cable to ensure an IP rating and secure connection of the connector. Termination: How are Powersafe Panel Mount Connectors terminated? Panel Mount are secured with an M12 threaded post termination. The standard connector is mounted to a panel through 4 fixing holes on the flange. As an alternative, flange holes can be fitted with M6 threaded inserts for either front or rear fixing. Panel connectors are supplied fully assembled and ready for direct mounting to equipment. 1. When the panel Connector is mounted in equipment: remove the nut and washer from the threaded post section. 2. Fit your selected terminal or accessory (i.e lug) over the threaded area. 3. Refit the Washer and bolt on to the threaded area and tighten to a maximum of 12 – 14Nm. Panel Mount Amps, what is T5 and T8? Powersafe industrial sockets are rated either 500 amp (T5) or 800 amp (T8). The ‘T’ stands for Threaded Post Termination. The ‘5’ and ‘8’ stand for 500A and 800A respectively. The standard Powersafe Sequential Mating Box has 5 ports for three phase electricity (Earth, Neutral, Live 1, Live 2, Live 3). However, some electrical specifications do not require a neutral line, therefore we manufacture a 4 port box. Alternatively, you can use a 5 port box with a dummy connector to transform it into a 4 port box for temporary applications – please ask our Sales Manager. The Powersafe Box is available in both source and drain versions. Source Boxes are usually the live end of the connection. The Source Powersafe Box accepts connection with Drain Connectors. Drain Boxes are usually not live ends and receive the connection. The Drain Powersafe Box accepts connection with Source Connectors. The Powersafe Power Distribution Box comes with an optional Lid as an extra. The product lid ensures an IP67 rating when not in use and protects the box from the environmental damage. As the box is often left unused as a backup for power outages, it is recommended that the lidded version is purchased. The Powersafe Sequential Mating Box has a straight front panel that comes in two panel sizes, 88mm and 108mm. Within different racking and panel mounting applications different sizes are required. The mark of UL approval is granted by the Underwriters Laboratories company, an independent safety science organisation dedicated to promoting safe living and working environment. With over a century of expertise in innovating safety solutions, UL helps to safeguard people, products and places, whilst facilitating trade and providing buyers with peace of mind. You can find out more about UL certification and the tests that are carried out to gain certification, by visiting the UL website. UL Certification is usually required in the USA and Canada. Powersafe UL Connectors are rated slightly lower to match with UL Certified power cable current ratings – this helps users avoid confusion and adhere to UL testing standards. Our standard 500A connectors are downgraded to 455A and our standard 800A connector is downgraded to 615A. In line with the adjusted ratings, UL Connectors are only available for devices with terminations below Crimp 150mm2 and Set Screw 120mm2. View the Powersafe UL Certificate.